This course/treatment addresses difficulties maintaining clear, single, and comfortable vision in a prolonged near vision task such as reading. It improves poor binocular eye coordination, poor eye focusing, or poor eye tracking skills to increase stability of visual grasp on words to better visually feel and understand the words or track along a line of print. Therapeutic intervention at the Clinic combined with professionally monitored and coached home assignments can treat this condition to maximize success in learning. Medically necessary diagnosis and treatment are billable to medical insurance. Before you can read a word you have to be able to visually grab hold of it. This means the two eyes must coordinate to point exactly at the word, and the word must remain in focus. 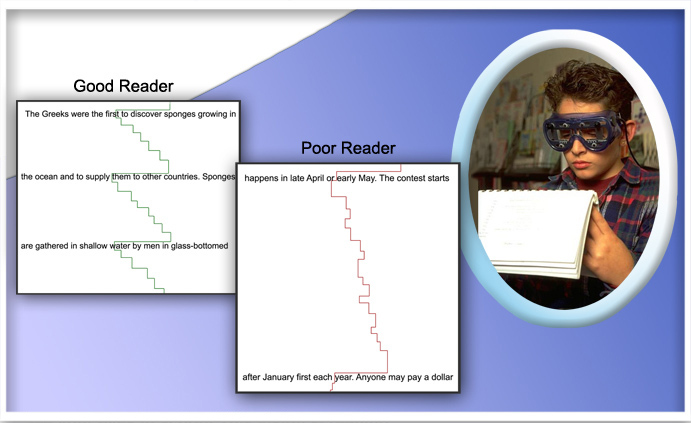 Reading depends upon the ability to maintain clear (focused) and single (two eye coordination) vision in a sustainable way. And then the eyes must track efficiently from left to right, top to bottom. WHAT IS BINOCULAR INSTABILITY / CONVERGENCE INSUFFICIENCY? Binocular instability negatively impacts at least 5% of the population. It causes symptoms such as visual fatigue, eye strain, headaches, double vision, blurry vision, moving words, and loss of place when reading, doing computer work, or other near point visual tasks. The condition is present in more than 30% of children who are struggling in school or reading. The condition impacts many adults who have had a concussion or acquired brain injury. Binocular instability is defined as difficulties establishing and maintaining clear and single vision during prolonged visual tasks. There are many different types such as convergence insufficiency/excess (involving two eye coordination) or accommodative insufficiency/excess (involving eye focusing), but the symptoms and treatment are similar. To diagnose a binocular instability takes testing that usually goes beyond a standard regular eye exam. A Functional Vision Evaluation involves more involved functional testing of near point visual performance. Most patients with a binocular instability can pass a regular eye exam with good eye health and no need for eyeglasses, but they may still have a functional problem in coordination of their two eyes together with eye focusing in prolonged near point tasks such as reading or working on a computer. Treatment of straightforward binocular instability (not involving other significant vision issues) can usually be completed over a 4 to 5 month period using a combination of weekly clinic visits combined with home assignments completed 5 times per week. At Vision Clinics of Development & Learning we use software that assists in the motivation and compliance with the home prescription. While not all insurance plans cover vision therapy, if your insurance plan does then binocular instabilities such as convergence insufficiency are the most likely diagnosis that qualifies for coverage. No insurance plan covers all of the costs, and copays, deductibles, and coinsurance apply. Children age 6 and up. Complete 20 – 30 min. per day at least 5 days per week. Clinic visits every 1 to 4 weeks are essential for this course. Vision therapy & progress sessions are prescribed by the doctor, are a separate medical procedure, and are billable to medical insurance. These sessions occur every 1 to 4 weeks. Call 425-702-0807 to schedule a FREE Reading Success Assessment.